One of At Home's most faithful readers, Rowena, is going to Paris! I'm so excited for her I can't even explain it. So I've put together a little guide for her. I had to hold myself back because I could go on for days about each area of Paris. But I think one of the nicest things about Paris is that you really can't go wrong. It's all beautiful, there are great shops all over, so just enjoy and don't try to cram too much in! Check out Beaubourg/The Pompidou Center and from there find your way to Rue Des Francs Bourgeois, it runs east west starting to the east of the Pompidou. If you follow this you will find a Muji, Auteur du Monde, and a bunch of great little boutiques. 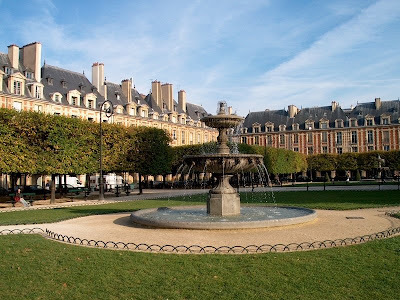 You'll end up at the Place des Vosges where my grandmother always lived, so a special place for me. But lot's of people congregate there, it's the oldest square in Paris. Chez Paul for a very French experience. Pause Cafe for a neighborhood experience. If you like clothes I love Isabel Marant who has a boutique right across from Chez Paul. Printemps, which I prefer to Galeries Lafayettes. As you're walking towards to Louvre, make sure to take a small detour into the Palais Royale where you can stop at the smallest shop in Paris which sells music boxes. This also happens to be owned by my other grandmother, Anna. Aptly, it's called Anna Joliet Boites a Musique. If you do go there, say hello and say you know me. They'll be thrilled. My other favorite part of the city is Montmartre, get off at Metro Abbesses and then just walk around, you won't be sorry. 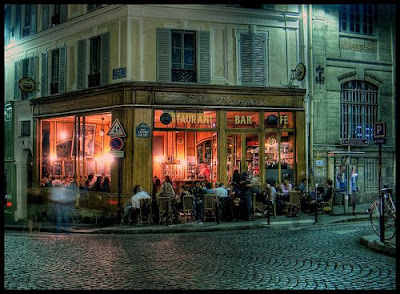 It's narrow streets, on a hill, hip neighborhood, great cafe's like Chez Papa and bars like Le Progres. Pick up a Pariscope which is the equivalent of an LA weekly. You can buy it at any newsstand/kiosk. This'll tell you what the museums have going on and what movies are playing and the flea markets, etc. Generally, you must try some macaroons and you must just drop by a Monoprix, a nicer grocery store, to check out all the mundane products that make up daily life. Anyone else? Can't miss spots? Merci beaucoup! 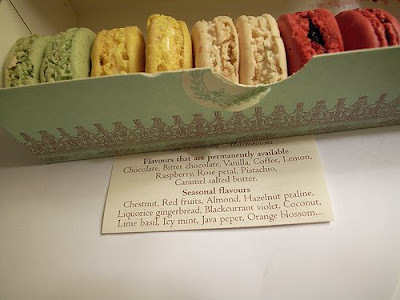 The macarons are foremost on my list! I'll definitely visit your grandmother's store and say hello and take pictures. I'm partial to the 5th arrondisement on the left bank. Morning, noon and night, it's filled with students from Le Sorbonne and other nearby colleges. There are lots of inexpensive ethnic restaurants and cafes for hanging out. Check out Le Rue Mouffetard for a crepe and people watching. I am leaving for my first trip to Paris in 2 weeks and 2 days. And I just happen to be staying near the Bastille. I cannot thank you enough for this. 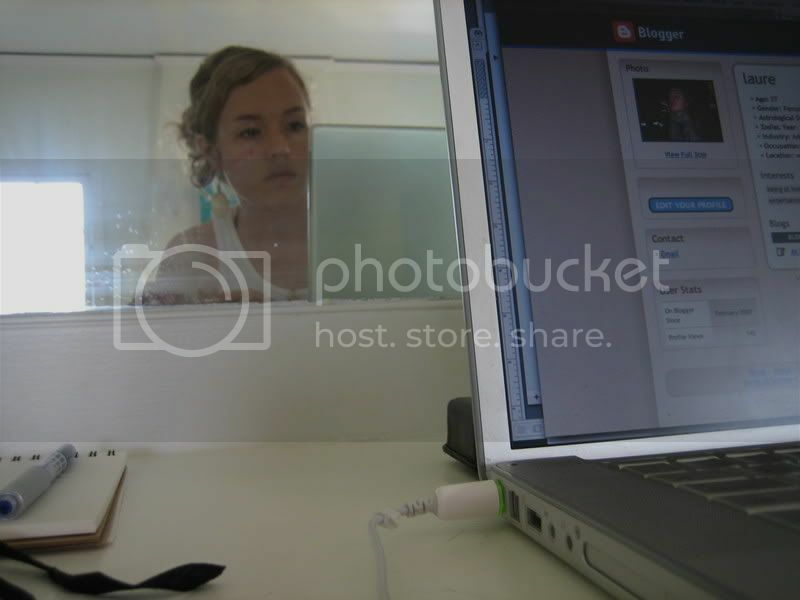 stacy--that's great! don't miss the Marché d’Aligre which is just down ledru-rollin everyday. Also, there's a great monoprix on the corner of Faubourg St. Antoine and ledru-rollin. And there's a giant market in the place de la bastille every sunday that's great to walk around and buy fresh food! email me if you have any specific things you're looking to do! Wow - I can't believe that your grandmother lived in the Place des Vosges! That's my favorite square in Paris. 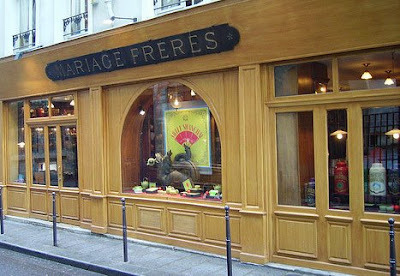 Also, you are so right about the Mariage Freres - it's such wonderful tea, and such a pretty store. I'll be in Paris in July and can't wait to look up some of these other shops. Thanks! I want to go now! I can't add to this... except to say that Paris is WONDERFUL! I need to go back... and this makes me want to pack my bags and run for the plane! I feel relieved now. I have only been to Paris once and luckily I stayed in Le Marais, and visited most of what you highlighted. I know there is so much more and I am dying to go back. At least I know I started in the right place. It was magical! How could you leave "Au Levain du Marais" off the list? Bakery near the Bastille (on blvd Richard Lenoir I think - google it)... Get there in the morning and get one of the best croissants of your life, no hyperbole. Also, you should check out the Canal St Martin (my old neighborhood!). It actually starts near the Bastille. Great little area to go for a stroll, have a wonderful meal at a great cafe and have a drink at one of the many bars there. Definitely worth checking out. Leche-Vin on Rue D'aval. It's got some pretty awesome decor. And right around the corner from there is a great place to eat called Cafe de L'indsutrie. AND, for decor, how could I forget to mention Habitat. There's one on Faubourg St. Antoine, but the better one is on Rue de Rivoli by Samaritaine. 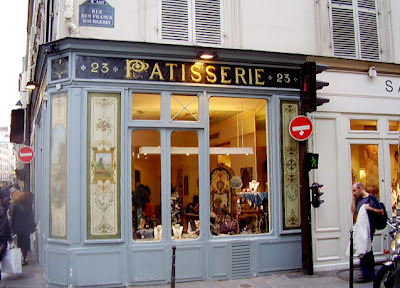 One of the best pâtisserie in town (and I've tried few of them) in the Marais. Friendly and unpretentious. Design and home decor. A very good selection, très "pointu" how we would say in french. 39 rue Sainte Croix de la Bretonnerie 75004 Paris. Italian food in a cosy and very parisian atmosphere. Also, the canal is great, particularly the sections between République and the Square Villemin and then at the wider Bassin de la Villette north of Stalingrad (where I live). The one thing I don't really agree with is Café de l'Industrie, unfortunately. I used to live round the corner and it was my surrogate sitting room, so I have a real soft spot for it, but it's expanded beyond the capacity of its kitchens - still a great spot for a drink, day or night, but the quality of the food has really gone downhill. Chez Janou behind the Place des Vosges is quite a good bet instead - but get there early!